Our stamp sets are so much fun for creating little scenes. Pull up a chair and get some creative ideas for mixing and matching our products to come up with creative and fun scenes! Watch the video below or click here (MFTv - Our Story Scene) to watch it on YouTube. Don't forget to subscribe to our YouTube channel so that you don't miss a single tutorial! Let's take a look at more examples of designs showcasing a cute scene using products from My Favorite Things! Making an outdoor scene is fun and easy with our many options for creating landscapes. In her design, Barbara created a grassy knoll with the Scenic Safari and Grassy Edges Die-namics. For the sky Barbara used the Puffy Clouds Die-namics and a sunny circle from the Blueprints 21 Die-namics. 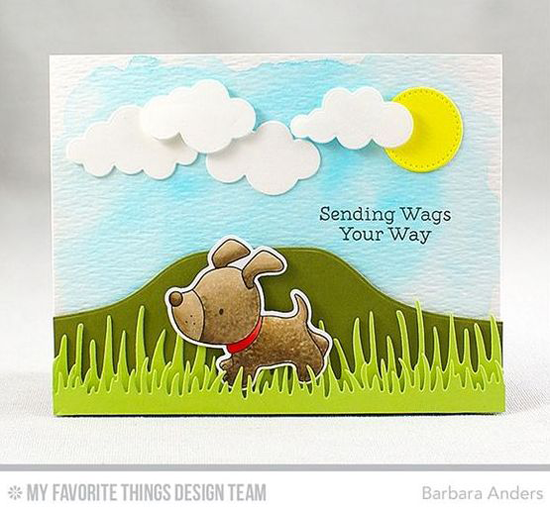 It's the perfect environment for the sweet little guy from the Playful Pups stamp set! 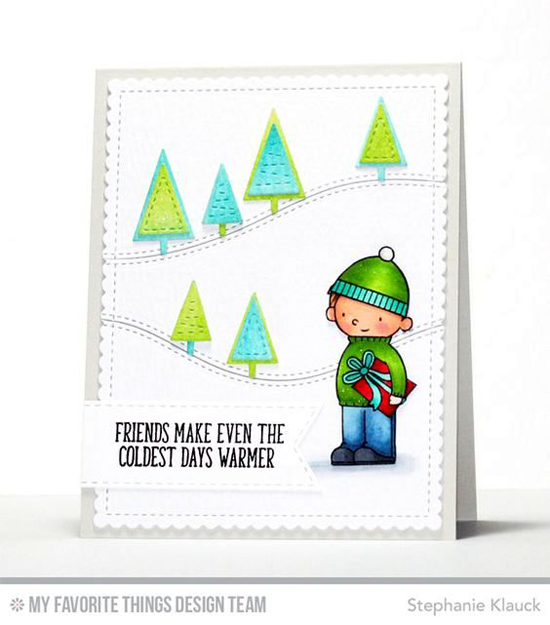 Stephanie created a vertical scene for her adorable wintry design. The Hit the Slopes Die-namics creates stitched hills, and Winter Trees dot the snowy ridges. Her gift-bearing young gentleman is comprised of the boy from Our Story, a hat from the Cooler with You stamp set, and a gift from the Merry Everything stamp set. What a fun collaboration of cuteness! Anna created an adorable indoor scene with the Somebunny I Love and Our Story stamp sets. She also used three background stamps to add homey detail — the wallpaper is the Distressed Stripes Background, the floor is the Diagonal Chevron Background, and the blanket detail was created with the Lined Up Dots Background. She adds depth to her design with the Classic Window Die-namics allowing a peek at the pretty night sky. You will LOVE creating scenes with our adorable stamp sets! Be sure to tag #mftstamps when you post your projects online. We can't wait to see what you've made! These are all amazing cards, thanks to Stephanie and Francine for that amazing card/video!!! !